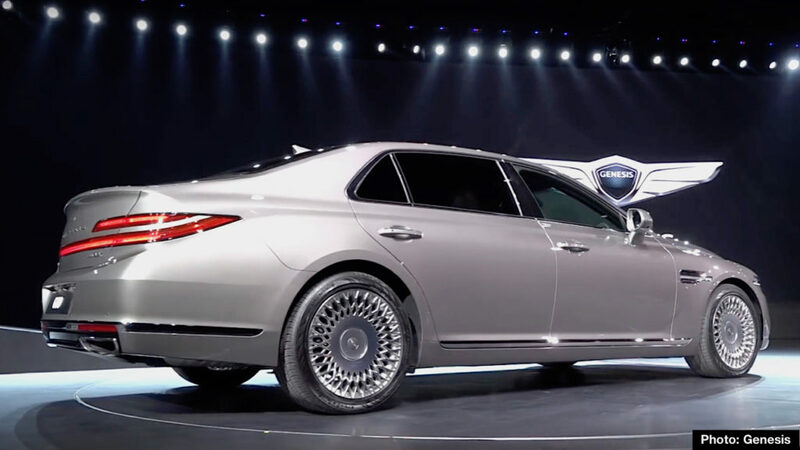 Genesis unveiled the redesigned G90 luxury sedan today in Seoul. With its bold new styling, the G90 is scheduled to replace the home-market model, called EQ900. Genesis says it plans to roll out the new G90 to additional markets next year. 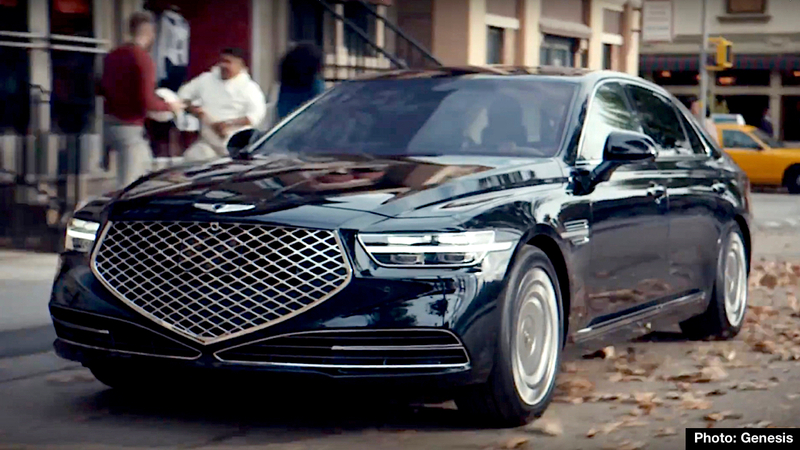 The flagship sedan gains new front styling with an elegant, larger crest grille flanked by dynamically designed headlights. G-Matrix quad lighting elements are said to be inspired by an illuminated diamond. G-Matrix is also applied to the redesigned rear flanks where taillights extend across the lower edge of the decklid and wrap neatly into the fenders. The G90 on display at the new model reveal is equipped with a turbocharged 3.3-liter V6 engine teamed with HTRAC all-wheel drive. Additional powerplants that may be carried over from the EQ900 include a naturally aspirated 3.8-liter V6, and 5.0-liter V8. Genesis Adaptive Control suspension with electronically controlled dampers is on the equipment list for the new model. 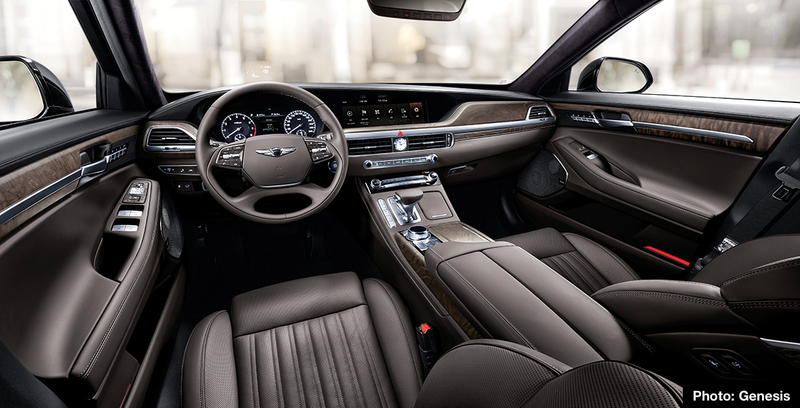 Inside, the new G90 becomes the first Genesis to offer over-the-air wireless updates for maps and software. The 12.3-inch navigation display with split-screen design gains an improved Graphic User Interface with zoom-in and zoom-out capability. Other high-tech goodies for the Korean-market G90 include standard Kakao I, Apple CarPlay™, Android Auto™, and Mirror Link. An Intelligent Car Management Service is said to analyze driving patterns and personalize the driving experience. The roster of advanced safety features for G90 includes Lane Follow Assist (LFA), Rear Cross-traffic Collision-Avoidance Assist (RCCA), Forward Collision-Avoidance Assist (FCA), and Safe Exit Assist (SEA). Features and specifications for Korean market models are subject to change without notice.